With Mazda getting ready to end production of the RX-8, it seemed fitting to take a look back in history to see just how the rotary powered Mazda faired in the US nearly 30 years ago. The newspaper article on the right is from the Thursday, March 1st, 1973 edition of the Toledo, Ohio paper; The Blade. With the introduction of the 1975 EPA air-pollution standards, came required catalytic converters and unleaded gasoline. While some US car manufacturers struggled to meet the strict (for the time) standards, Mazda was decades ahead. Maybe so far as to say that the US auto makers were trying to insinuate that the Japanese based Mazda was somehow cheating the system. In continuing with the rotary history lesson, the article below is from the Pittsburgh Post-Gazette (June 29th, 1973). 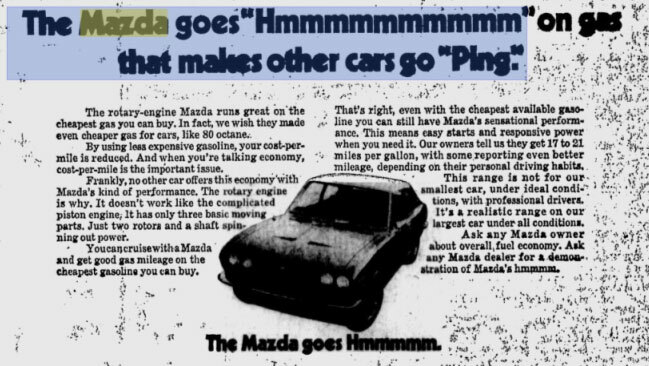 While some auto makers were having trouble with detonation due to the newly introduced unleaded gasoline, the rotary powered Mazda showed no signs of weakness in part to the limited number of moving parts and overall simplicity of the rotary engine design. After having such a long history with rotary engines, will Mazda finally say goodbye to the rotary engine? Will we see an RX-7 inspired vehicle from Mazda in the near future? In more recent rotary inspired news, last weekend, three race teams (SpeedSource, Dempsey Racing, and Team Sahlen) raced with special logos on the sides of their vehicles promoting donations to the American Red Cross to help fund the Japan Earthquake Tsunami Relief Fund. The Mazda Foundation also made a #150,000 donation. If you would like to donate $10 to the Red Cross Japan relief efforts, simply text REDCROSS to 90999. Next PostNext PRESS RELEASE MADNESS: FOUR PRODUCTS; ONE POST!